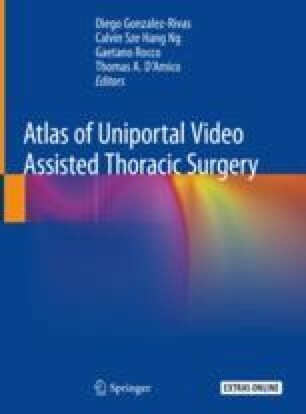 Video-assisted thoracoscopic surgery (VATS) through a single incision grows increasingly popular in recent years, as a safe and feasible procedure with good postoperative outcomes. The advantages of this approach include direct view to the target tissue avoiding the use of the trocar, anatomic instrumentation and potential less postoperative pain. The improvements in both endoscopic instruments and surgical skills have allowed to perform not only initial stages but also complex cases with success, following the oncological principles for major pulmonary resection. However, uniportal VATS lobectomy remains a challenging technique for thoracic surgeons. For the right upper lobectomy, the most complex structure to divide through an uniportal approach is vein of the upper lobe and represents the main reason for conversion to double port technique during the learning curve. Because of this, we usually recommend to divide the upper arterial trunk first. The rest of the operative sequence is similar to the fisureless technique for conventional VATS.